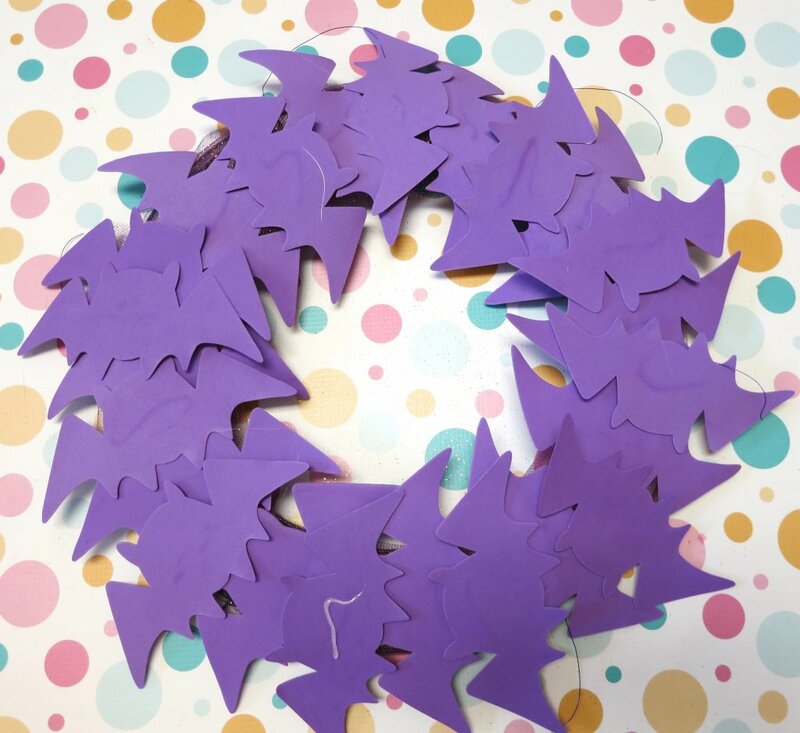 Make a bat wreath to create not-too-spooky door decor. Halloween is my favorite holiday to decorate for. 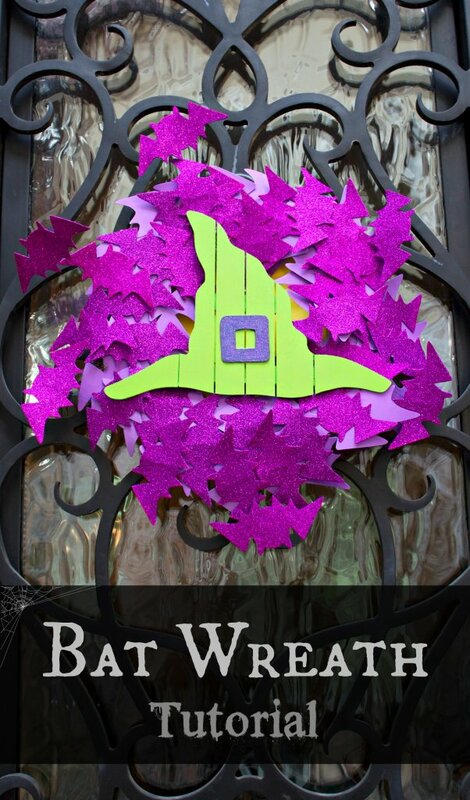 I like to make new and different wreath ideas to decorate my front door with each year. 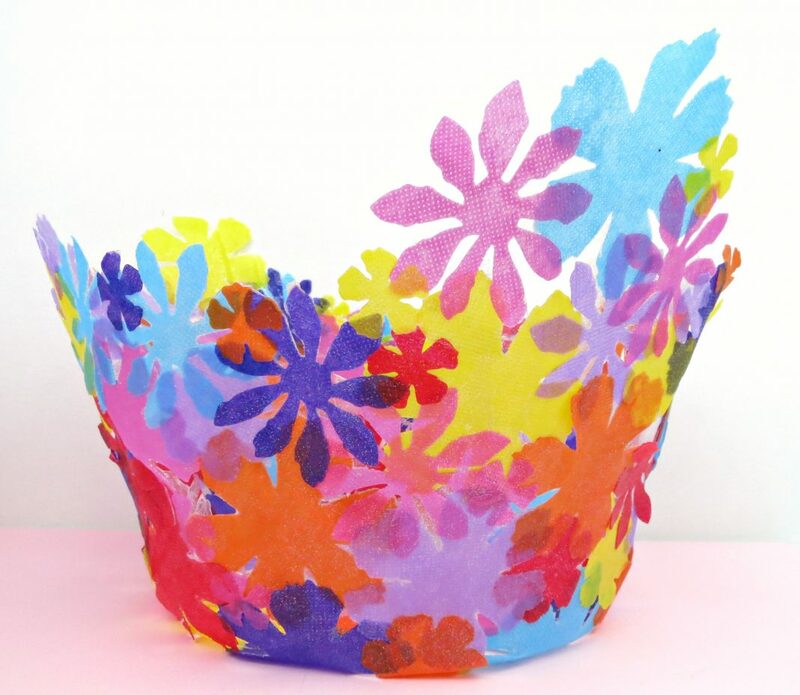 I rounded up several supplies to quickly and inexpensively create this colorful Halloween wreath. 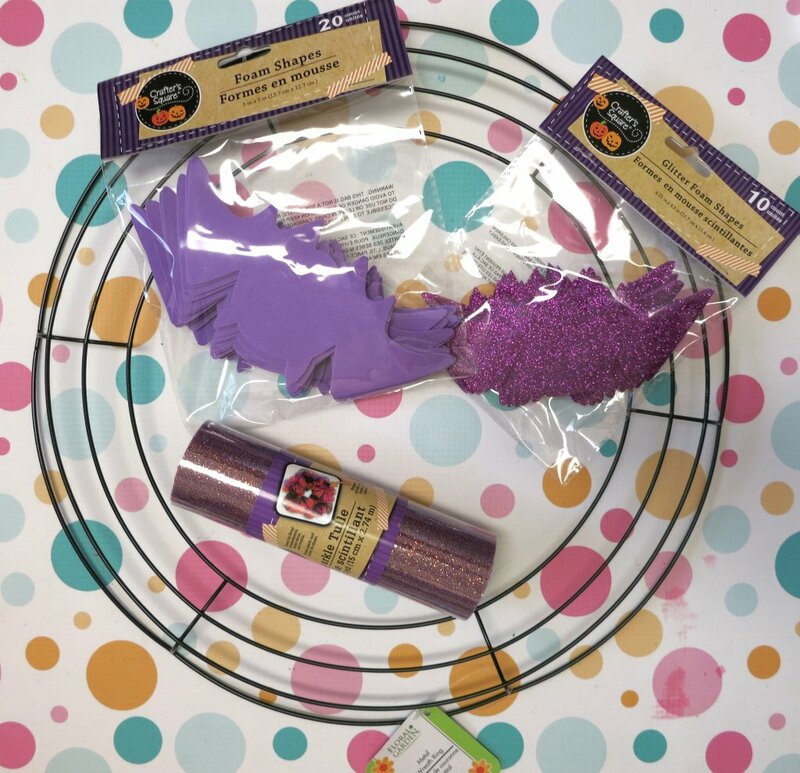 Almost everything used to make this project came from Dollar Tree, so you won’t spend a lot to make this large, bright Halloween wreath! 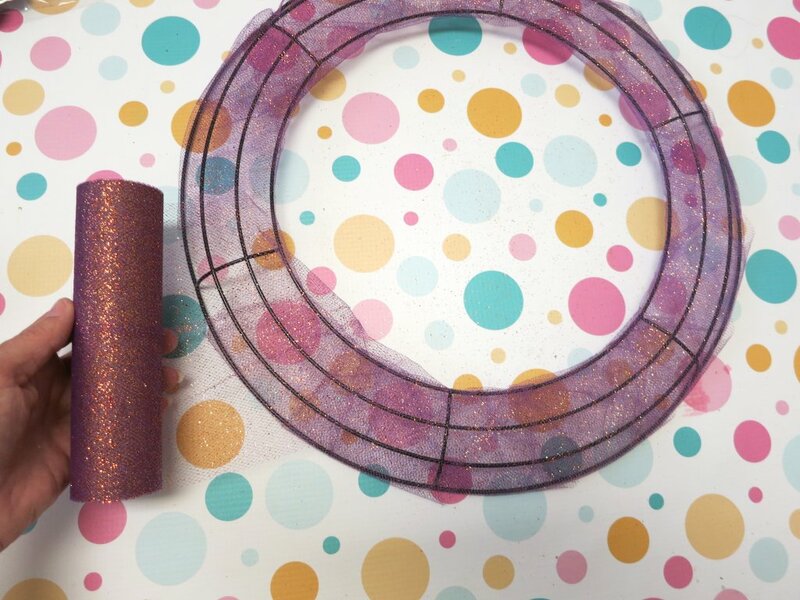 Wrap the metal wreath form with tulle. This will help the bats stick better. I tied one end to the metal form and then started wrapping the wreath form. 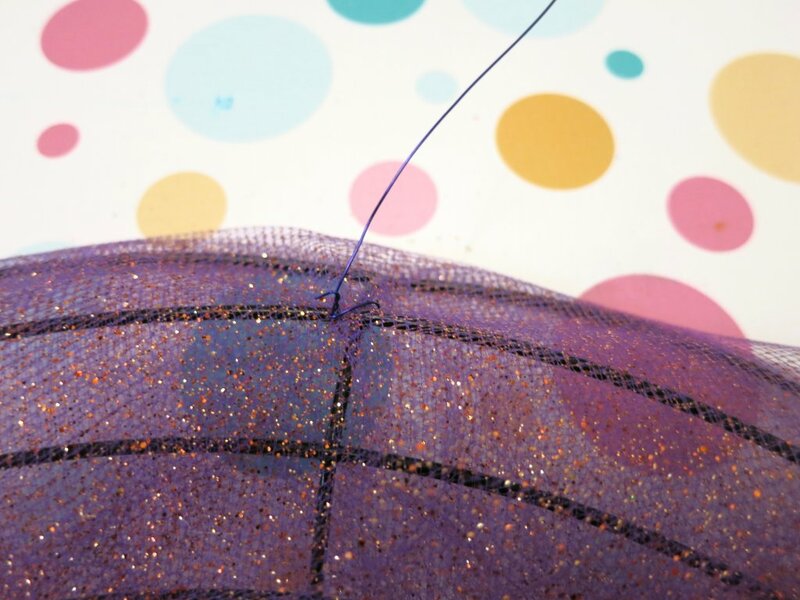 You can pin the end in place. 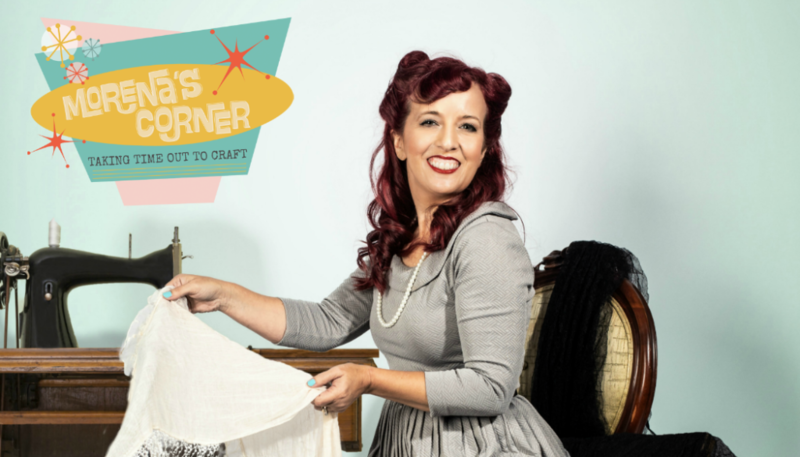 Cut 6-8 inch pieces of craft wire and wrap them around sections of the wreath form. These will be used to help some of the bats “fly” off the wreath form. 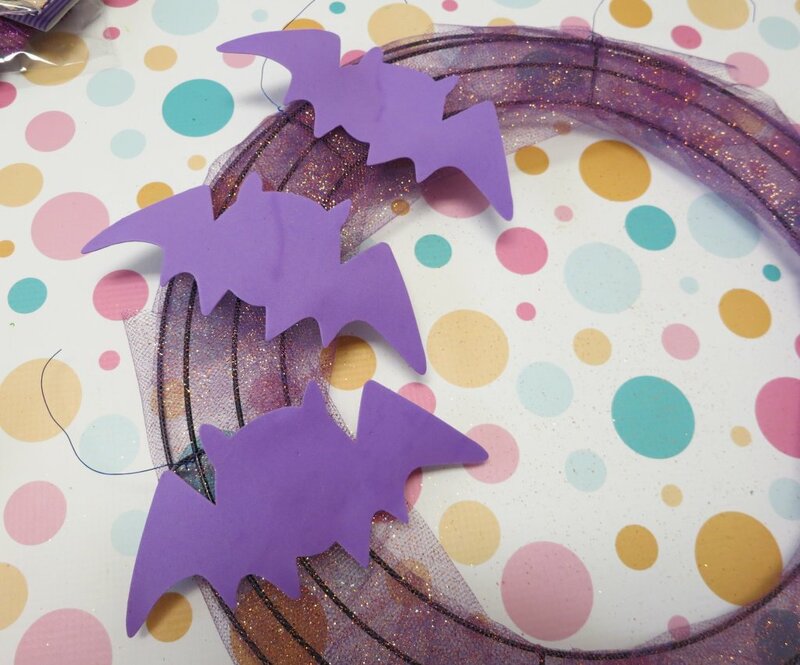 Start hot gluing the bats onto the wreath form and the wire ends. 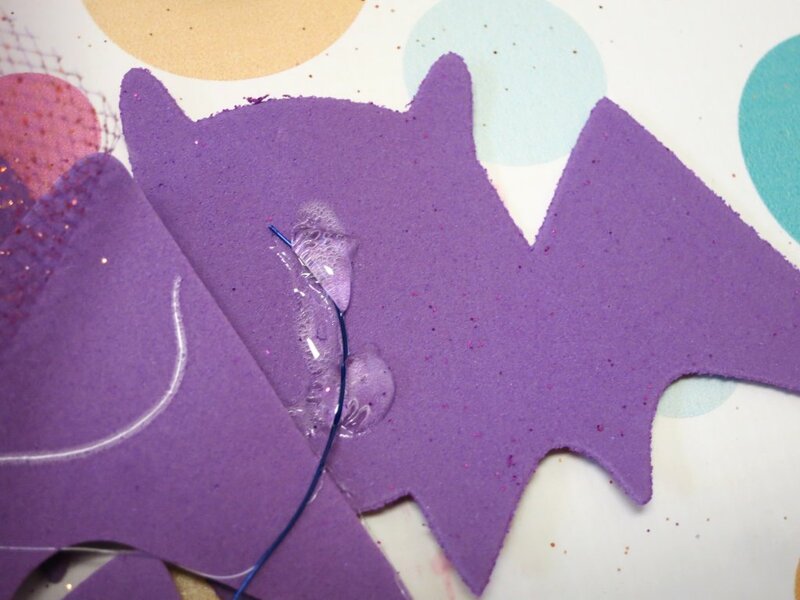 I started with plain purple bats first, then added the glitter bats on top. Continue moving in one direction until the wreath is as full as you like. I used approximately 40 plain bats (two packs of 20) and 30 glittery bats. 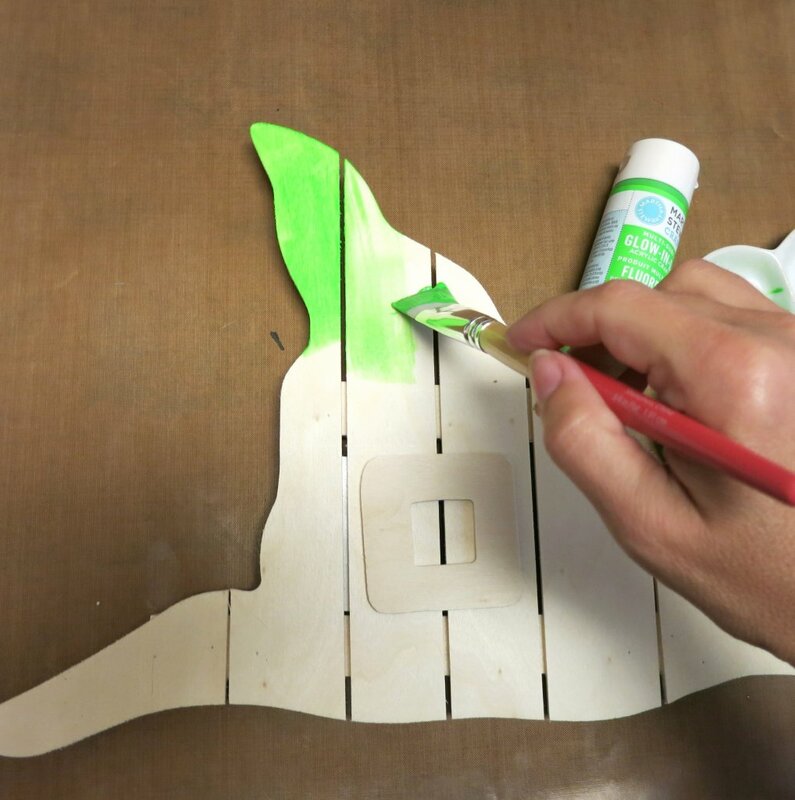 Paint the unfinished wood witch’s hat. I decided to use green and purple paint, since that’s my favorite Halloween color combination! 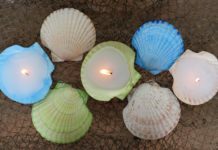 My paints were glow in the dark, to add to the spookiness! Hot glue the hat on top of the bats. I also glued a piece of yellow fabric to the back of the wreath to look like a full moon. 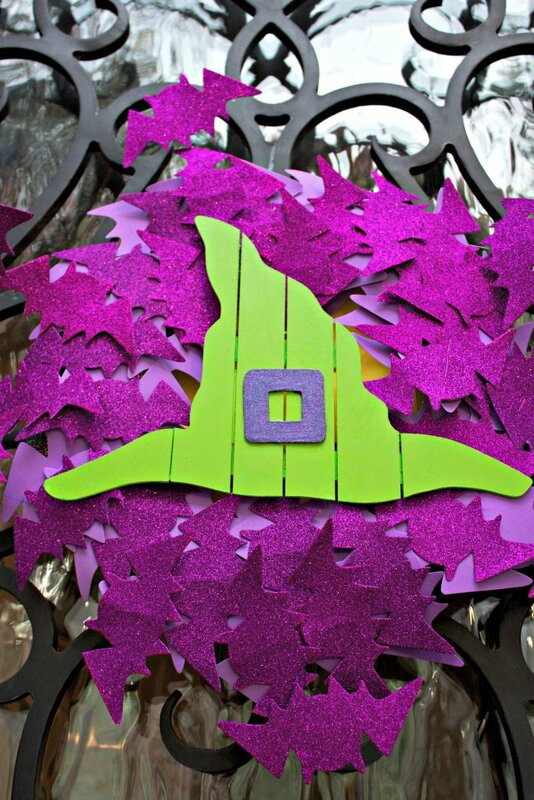 I love to use the purple and green color combination with my Halloween decorating. If you prefer the more traditional orange and black color scheme just use black foam bats instead of the purple ones I chose. 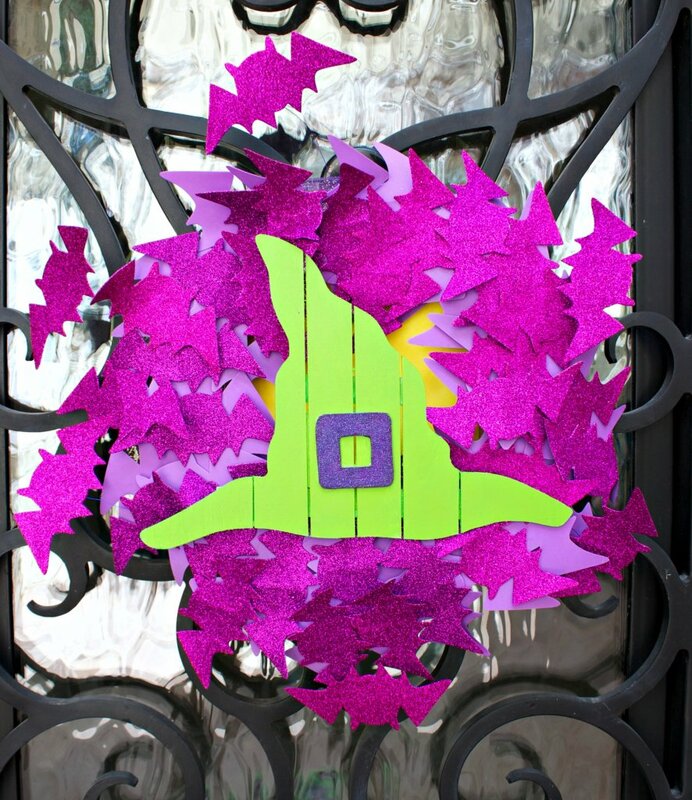 This witch hat wreath is a fun, not-too-spooky way to greet visitors to your home this Halloween! 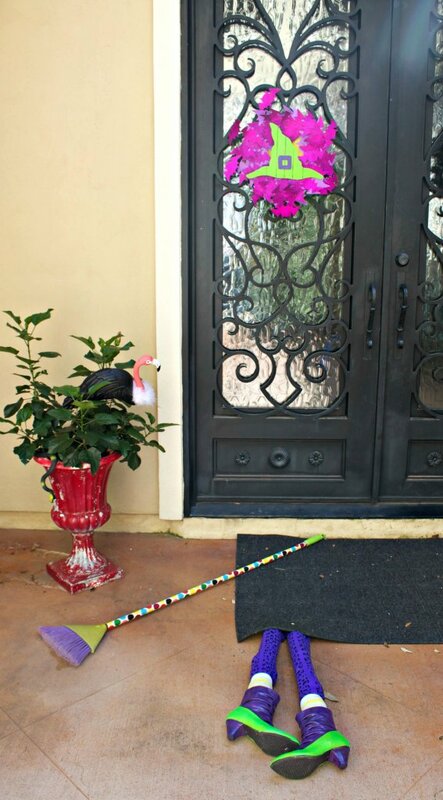 My wreath looks great with the crashed witch mat (tutorial HERE) and my flamingo turned vulture watching nearby (tutorial HERE). 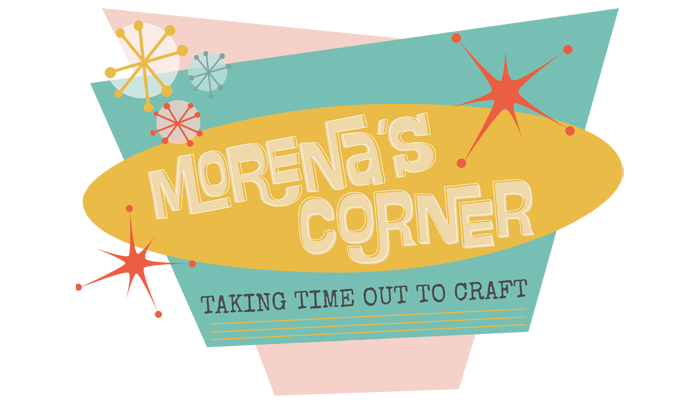 Have fun crafting and creating for Halloween!